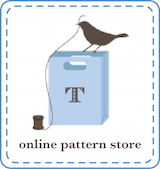 A few very lovely pattern designers and bloggers have helped me test my patterns to get them market-ready. One of these is Rowan, at Three Pink Threads. Rowan very kindly put her hand up to sew the Isabella Flutter Sleeve Top for me when I put a request out for testers. And just look at the gorgeous results - made all the cuter by her daughter. How cute are those cheeks? Rowan is a talented photographer as well, as you can see by these lovely photos. I love the touch of the fabric covered button Rowan has used. This fabric is a pretty Liberty Lawn by the way. Thank you Rowan for helping me get my pattern to market. 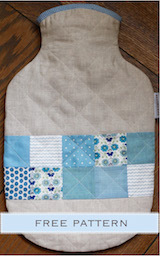 Pop on over to Rowan's blog to see more of her lovely photos and to pick up some sewing tips. I knew when I sent some Townmouse onesies over to Amy of Nana Company she would do marvellous things with them. Amy recently instagrammed this cute pic. You've got to love that. If anyone wants to try something similar, I still have stock of onesies in three sizes (newborn, 3-6 months and 6-12 months) in short and long sleeved. Email me (top of the left sidebar) if you are in need and we can talk. I confess to being a lover of wool felt. I have felt iPad and laptop cases. A few Christmases ago Will gave me one of my favourite presents ever - a grey wool felt weekend bag he found in Italy. When planning for storage on shelves above the children's 'lockers' in the garage I had my eye on these. I'm always drawn to products in wool felt. So when I saw this little Sleepnest I was very sad that my newborn days are behind me. I would have loved one of these for my children. And I'm sure Adelaide would enjoy putting her dolls to bed in it too. This was the window display just before Christmas at a sweet shop not far from me. I rather liked the look of this antique ladder so took a photo of it to discuss with Will the possibility of bringing it home. Then I promptly forgot about it until I rediscovered the photo on my phone. Well the ladder had sold but I still like to admire this pretty window display. These ladders are a lovely idea but you need to have quite a large space to use them in. They have a large footprint and encroach into a room quite a bit. There's certainly no space for it in our crowded house. It's probably just as well I wasn't too tempted. How cute is this room? Found this great cottage for sale in the seaside town of Flinders, where we spend our summers. It's perched above the Flinders golf course, so you get a view of golf course and wild ocean. I think this room is charming and would be very happy spending a cold, wintery weekend on one of those sofas. I hope someone I know buys it. Maybe we'll get invited over. I'd love to spend some time here. Isn't this quiet spot just dreamy? I love everything about it. This would be a lovely spot to retreat to with a cup of tea and a good book. I've pinned this onto my Pinterest board titled "Nooks". I'm finding so much lovely inspiration on Pinterest for our next house. Now we just need the house! I was very excited to receive my copy of Fiona Dalton's new book, "Hop, Skip, Jump". This book is fabulous. I absolutely love it. Fiona is a such a talented toy maker, and the little outfits she makes for her softies are so clever. Look at the cute little vest this chap is wearing. See more in her amazing Flickr stream, or on her blog, Hop, Skip, Jump. I can't wait to find some time to make up one of the patterns in the book. But it seems I'm not the only family member who likes to make soft toys. This is 6 year old Henri's creation that he made in art. It made it onto the School Library display wall. Henri was very proud when I bought my camera into the library especially to photograph it. A friend came to stay with us at Flinders over the weekend and bought a beautiful mail order catalogue from German store Manufactum. It's full of beautiful, utilitarian products. I'd love a pair of these slippers for indoors at the snow. There is everything from homewares to garden fences in this catalogue. And of course stationery. Let's not forget the stationery. How lovely would it be to do all your Christmas shopping from this store. I've mentioned before that Will has an involvement in Driza-Bone - that great, iconic Aussie brand. The current winter range has some fabulous, enduring pieces. Not surprising given that Steve Bennett, founder of Country Road, is the creative director and designer at Driza-Bone. Driza-Bone is currently having a little giveaway. You get to choose anything from the online store - that's right - anything at all. All you have to do is head to the Driza-Bone facebook page and "Like" Driza-Bone to be in the running. But you have to be quick. You only have a few hours left. My pick would be the Weekender Bag. Will uses his every weekend and it's the perfect size for all his gear. I find it interesting that inspiration can come via a very long and winding path. 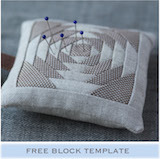 Alice, a fellow Australian (who lives in Rome) and long time reader of my blog, recently started her own quilting blog. In a post she mentioned following a blog called Beyond the Cherry Tree, where a group of applique enthusiasts are each recreating an old quilt and posting their progress. I have enjoyed following these posts and it has reminded me that this style of quilt is my first love. One of my favourite quilting books that I've had for 15 years or so is "Red and Green: An Applique Tradition". The problem is I'm not a huge fan of the colours red and green together (which is how this quilt came about). But I have been feeling the urge to do some applique again. I like hand applique because it's something that I can do on weekends or away from my studio. So I decided to go for something a little more modern and youthful. I want to make a single bed quilt for Adelaide in pink and orange. A visit to my local fabric store today resulted in these colours coming home with me. The greens were already in my stash, but the others are new. And I couldn't resist a few metres of Anna Maria Horner voile for the quilt back, as it blended perfectly with the colours I chose. Images of vintage quilts above are from this book and this book, two recent purchases on Amazon. When I find a moment to spare, this is what I will be putting some time into. But for now, there is a huge pile of unopened mail that needs attending to. Mum just found this in the games cupboard at Flinders. It's my father's paint box, containing old oil paints and brushes. When I took it outside to show him he casually mentioned that he had made it. I'm so impressed. It's fabulous. Tomorrow is the day our whole family has been eagerly anticipating. We are heading down to Three Hummock Island off the coast of Tasmania. This year we are staying there for 10 days - our longest visit yet. We have been looking forward to this since we were last there over Easter. I have been very busy organising travel itineraries for friends who will join us. We have four groups of friends who will fly in for a few days each to stay with us. By coordinating flights we can fly from Melbourne to the island at much the same price as a discount airline fare to Tasmania. Every three days or so a plane will come in with one group, and depart with another. Meanwhile we'll be busy in the homestead changing bedlinen and catering for our guests. One friend has just sent a text to say she's thinking of organising an island 'Survivor style' treasure hunt with hidden immunity idols, clues and physical challenges for the adults and children to participate in. Sounds like fun. The boys will absolutely love that. I don't think we'll starve. And a first for me - I've baked a few loaves of bread this year. This is a Tuscan style breadmix that has a wonderful crunchy crust. As soon as it was out of the oven I had that end piece covered in lashings of butter. Yumm. The boys have been devouring it hot from the oven after morning sessions at Little Nippers.